Who hasn’t enjoyed the feeling of learning something that blows away a preconception? For intrepid travelers and longtime locals alike, Fort Point National Historic Site - tucked up under the Golden Gate Bridge in San Francisco- represents a chance to update their knowledge about the Civil War, and have a jaw-dropping scenic experience at the same time. When most people conjure up the Civil War, their minds jump to the hallowed places of the South or Mid-Atlantic states. Very few people imagine that the drama of the Civil War played out west of the Mississippi, too. And yet Fort Point stands a reminder that the Civil War extended all the way to the shores of the Pacific Ocean. 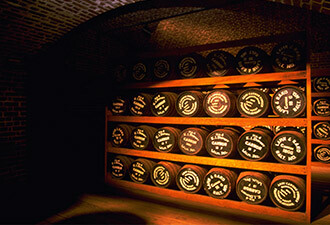 Construction began on Fort Point in 1853, as the winds of war swirled in the East. The fort was designed to secure San Francisco Bay, and ensure that the city of San Francisco, portal to the gold fields of the Sierra Nevada and the silver mines of Nevada, would never fall into any antagonist of the Union. Did Fort Point deter a Confederate attack? Perhaps. History has revealed that the Confederate vessel Shenandoah was patrolling perilously close to the mouth of San Francisco Bay, though it never attempted to enter the bay. Today, getting to Fort Point is part of its allure. The six miles from the beautifully-restored Ferry Building at the foot of Market Street in San Francisco to Fort Point and the Golden Gate Bridge is highly recommended as one of the world’s great waterfront explorations. The route passes some of San Francisco’s best-known landmarks, including the Pier 33 embarkation point for Alcatraz Island and the busy tourist zones of Pier 39 and Fisherman’s Wharf. San Francisco Maritime National Historical Park, with its stunning collection of historic vessels, and historic Fort Mason are two of the national parks on the route. The bay front pathway along the shoreline from Crissy Field to Fort Point is arguably among the top five scenic spots in the world, with visitors grabbing for their cameras at every step. Arriving at Fort Point, most visitors sense that the imposing four-tiered red brick bastion is a masterwork of 19th century masonry. Granite spiral stairways flank the parade ground, and above looms the steel girders of the Golden Gate Bridge. As fate would have it, the bridge and the fort are forever linked. Fort Point was slated to be demolished to make way for the bridge in the 1930s, but the engineer who designed the bridge ordered the original plans re-drawn because he admired the beauty and history of the fort. 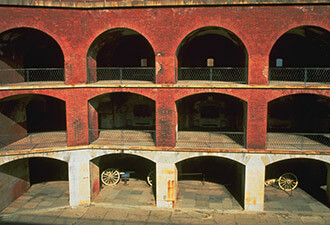 Fort Point is a must for anyone who wants to see how far westward the Civil War extended. It’s also a must for anyone who wants to enjoy sweeping views of San Francisco Bay, the Marin Headlands to the north, and the gleaming city of San Francisco to the south. The Pacific Ocean and the Gulf of the Farallones National Marine Sanctuary lie immediately offshore. Fort Point is open year round. Cannon drills, tours, including the popular Fort Point Candlelight Tour (reservations required), occasional reenactments by people in Civil War costumes, and a bookstore await visitors. Later period earthen bulwarks on the bluffs above the fort can also be explored. 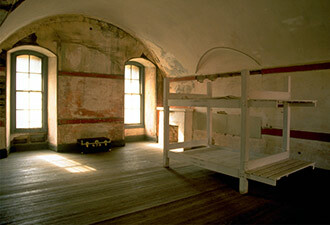 For more information, visit www.nps.gov/fopo, or call (415) 556-1693.